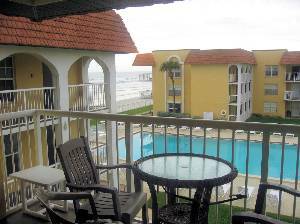 My two bedroom two bath oceanview condo is on the top 3rd floor close to the elevator and laundry facilities. 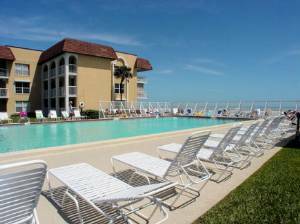 It's in an ocean front resort at Point East Condominiums, 3801 South Atlantic Avenue #304. The resort has an Olympic size pool (seasonally heated), a kiddie pool, shuffleboard, covered picnic area, fire pit area, and large ocean front lounging deck. The resort is in the preferred non-driving beach zone so it's a car-free beach for family fun and safety. This resort is located next to the 27th Avenue Ocean Front Park with a lifeguard on duty. The park has restrooms, outdoor showers, covered picnic area, playground, and recreation area. It's a great place to cook out and enjoy the beach just a few steps from the condo. This Deluxe two bedroom two bath condo has a beautiful ocean view from the private balcony and both bedrooms. The balcony faces south for warm southern exposure in the winter months. 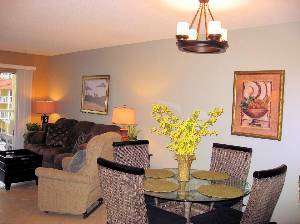 This condo is beautifully decorated and all floors are tiled throughout. 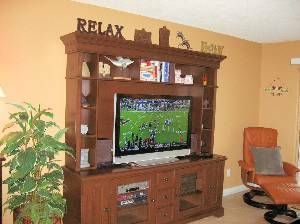 BONUS....Relax and enjoy our new 42" High Definition LCD TV in the evening. 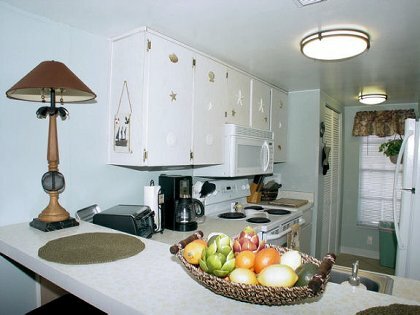 It has a well stocked kitchen with a pass-through breakfast bar and separate dining area. The kitchen has all new major and minor appliances, plus all utensils. 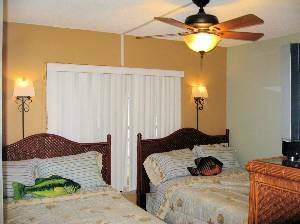 The resort has wireless internet and Cable TV in the living room, guest bedroom, and master bedroom. 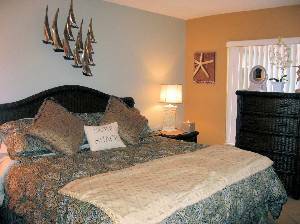 The Master Bedroom has a brand new Pillowtop king size bed, the guest bedroom has TWO FULL SIZE beds, and the living room has a queen size sleeper sofa and TWO comfortable recliners. Point East Ocean Front Condominium Resort is within walking distance to many restaurants and shopping plaza. The ocean is just steps away from the condo through the pool courtyard. The Olympic size pool is seasonally heated, plus there is a kiddie pool, shuffleboard and covered pavilion with party area and gas grill, fire pit. The beautiful ocean front park next door has a recreation area including basketball and handball courts, playground, restrooms, and covered picnic tables with charcoal grills. It's all located in the preferred non-driving beach zone so no cars are allowed on the beach. There's a life guard on duty at the park next door. 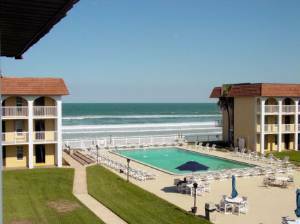 New Smyrna Beach is just one hour away from Orlando and Central Florida attractions. It's just 25 minutes to Daytona International Speedway. You can fly into Orlando International Airport, Daytona International Airport, or Orlando Sanford International Airport. Relax on your ocean view balcony which faces south for warm southern exposure in winter months. Well stocked kitchen with all large and small appliances, plenty of pots, pans, dishes, and glassware. Rental rates are subject to 12.5% tax and a one-time $80 cleaning fee. Discounted rates apply after Labor Day and the month of May. Rates may be higher during holidays and special events. 30 day cancellation policy with full refund less $25.00 handling fee. Deposit: $150 security deposit required. It's returned within two weeks of departure. Other Fees: Tax includes sales and resort tax combined. 30 day cancellation with full refund less a $25.00 handling fee.